Heritage Camps for Adoptive Families has been a significant part of my life for the past 20 years. Camp helped me find my identity and also a place where I truly fit in. 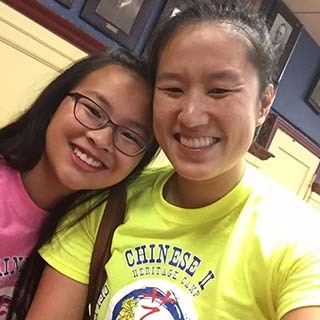 Outside of camp, no matter where I went, I never felt like I quite fit in because of my adoption – I wasn’t quite “white enough” being at American school, and I wasn’t “Asian enough” being at Chinese school as most of the other students there had Chinese parents who could help them. Besides providing a place where once a year I could go hang out with other kids who looked like me, who had families that looked like mine, I benefitted tremendously from the camp counselors and cultural community members, who were role models for me. This is important especially in today’s society since the media plays a big role in the types of people that kids look up to. Every counselor I ever had growing up was in touch with their cultural identity and had a passion for being at camp. Cultural community members not only helped me feel a connection to my culture, and an understanding that made me more comfortable later on in adulthood, but they made it incredibly fun. As an adult adoptee, I continue to benefit from the lifelong connections I made at camp, but I also have a chance to give back to this next generation of adoptees and adoptive families. I bring a unique perspective and valuable insight to the programming, and continue to contribute by being on adult adoptee panels and serving as a counselor coordinator. When you’re involved in HCAF, you truly gain a second family. I became aware of Heritage Camps for Adoptive Families just a few years ago, but in that short amount of time, camp has made such a difference in my family’s life. I am an adoptive parent to three kids born in South Korea, and two biological kids. Adding a layer to my relationship with adoption is the fact that I’m also an adoptee. I was adopted domestically when I was 2 weeks old. As an adoptive mom, camp has provided not only a place for my children to belong, but also a place for me and my husband to connect with other parents who understand our experiences. These parents have all filled out stacks and stacks of paperwork, waited for phone calls, and many have made long flights over oceans to bring their kids home. They have all struggled to figure out what attachment means and spent countless hours up with night terrors or dealt with severe anxiety, loss, and trauma in their kiddos. Those shared experiences connect us. The parent sessions at camp always make me think more deeply, and in new ways about what adoption means for our family. I walk away with new tools to navigate challenges as they come up. There’s a consistent feeling of support from other families, whether it’s through hugs and tears, or laughing as we take a break in a self-care or fun activity, like a paper folding class or my husband’s favorite class on Korean desserts. Throughout the year we find ourselves sending messages to those same families, continuing to share experiences, and helping us all become stronger parents. All my kids, even my bio kids, have started asking in October of each year if it is almost camp time. My kids benefit from having counselors who serve as amazing role models in ways that I never can. It’s affirming to be in a space full of families that share our experiences. For that weekend, we are the norm. As an adult adoptee, I look back and wish I had Heritage Camps growing up. If someone had asked young me or my parents if we wanted to go to adoption camp, I don’t think any of us would have said yes…. but now as an adult who has processed more about my adoption, I do wish I had this opportunity as a child. I know I would have cherished the chance to connect with other adoptees who also sat silently in class at school, wondering what to possibly write in their report on family heritage. I would have had a community of adoptees who shared the experience of leaving line after line blank on my health intake form. Because of the impact camp has made in my family and in my own life in just a few short years, I am honored to be able to serve on the Board of Directors for HCAF. 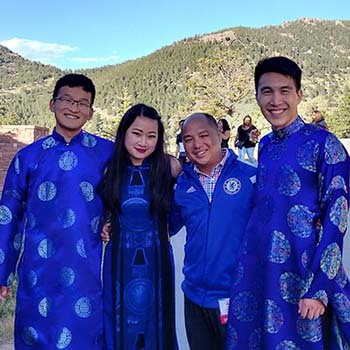 Since my family started attending Vietnamese Heritage Camp in 2005, our annual trip to the mountains has been the highlight of the year. As an adult adoptee who didn’t have access to camp growing up, I never had the opportunity to learn about my heritage as deeply as young adoptees can today. I also never had the chance to spend time and share experiences with adoptees; I didn’t see a large group of adoptees from Vietnam until 1995-2000. For families who attend camp and have seen the impacts that campers, counselors, and cultural community members have on their kids, you can imagine what it was like to not have those racial mirrors growing up. It impacted me greatly. I love HCAF’s specialized programs on identity, engaging workshops, the staff leadership, and that Heritage Camps values the adult adoptee community so much. They always listen to new ideas and encourage and support us to be leaders in our special community — whether on the Board of Directors, as a member of the Advisory Board, as a camp director, or as a coordinator. I love keeping in touch with the families and watching kids grow to become adults. As an adoptee, adoption will always be with me. My journey will last a lifetime. I’m grateful to have our camp family by my side. I will never feel alone. I’ve attended Indian/Nepalese Heritage Camp (INHC) for 15 years. I was originally introduced to HCAF through my parents’ involvement as members of the Indian community who were helping to shape and implement camp programming. Now as an adult, I continue to attend camp each summer with my wife and two young kids. 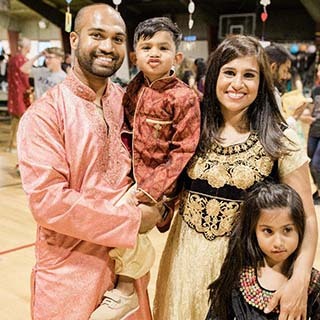 As a first-generation Indian/American, my experience growing up was hard because there weren’t many Indians in my community. The area I lived in and the schools I attended were predominantly non-Indian, so I can really relate with adoptees who are also racial minorities in their communities. INHC has helped me discover a new appreciation for my culture, which I took for granted before I was exposed to camp. The cultural connections you gain from HCAF can be very powerful and can be an instrumental piece that impacts your identity. Additionally, I had the wonderful opportunity to create HCAF’s newest video, capturing the impacts of the 9 different camps. It was a really incredible experience to attend so many camps beyond Indian/Nepalese Heritage Camps, and gain an even deeper understanding of how HCAF supports adoptees and their families.